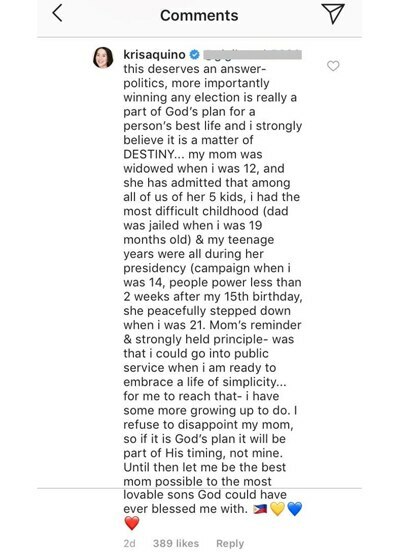 Kris Aquino again answers the issue about her entering politics. 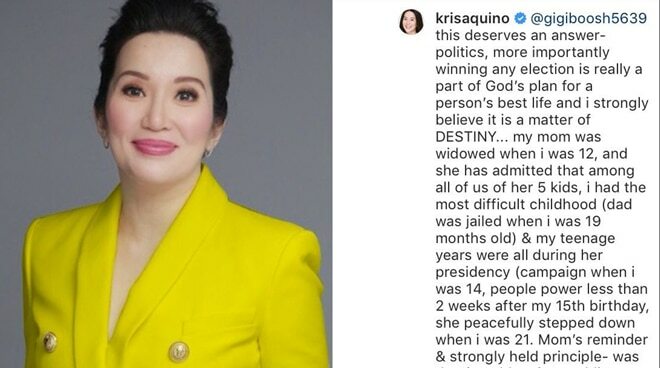 Sa isang instagram post ni Kris Aquino noong September 14 na birthday greeting niya para sa kanyang make-up artist, mababasa sa comment section ang pagsagot ni Kris sa komento ng isang netizen na gusto siyang maging pulitiko. (Through the Years as sung by @zsazsapadilla)... i got scared that i’d post this birthday greeting late so i figured best to be the 1st. @rbchanco is FAMILY. We have been working together for close to 8 years, but it is RB who really knows me inside out. As this video i edited will prove- i knew RB before the weight loss- searching through pictures i had stored in the cloud- i am so amazed at RB’s discipline... undeniably RB is beautiful but it is the GENEROUS LOVE & GENUINE CARING that has made kuya josh, bimb, and me adopt RB as our own... RB is the keeper of my most intimate secrets, and i have 100% trust that my heart is safe in RB’s care. RB is our favorite travel roommate- when kuya josh wasn’t well in HKG, it was RB helping me take care of him. When i wasn’t okay before we left, Bimb kept saying- “we need RB so you can be healthy.” It’s hard to promise forever- but RB is SURE of our love for my lifetime. Ayon sa netizen, “I am proud of you Ms. Kris!! I will always follow your destiny and truly hope you enter politics!!! But can’t blame you if you don’t but I think you will give your parents the ultimately dream and fight they wished for for our Beloved Philippines! 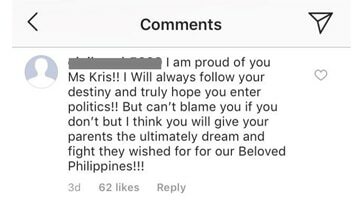 [sic]"
Sagot naman ni Kris, “This deserves an answer—politics, more importantly winning any election is really a part of God's plan for a person's best life and I strongly believe it is a matter of destiny." Nagsimula ding magbahagi si Kris ng tungkol sa kanyang kabataan, “My mom was widowed when I was 12, and she has admitted that among all of us of her 5 kids, I had the most difficult childhood (dad was jailed when I was 19 months old) & my teenage years were all during her presidency (campaign when I was 14, people power less than 2 weeks after my 15th birthday), she peacefully stepped down when I was 21. “Mom's reminder & strongly held principle—was that I could go into public service when I am ready to embrace a life of simplicity... for me to reach that—I have some more growing up to do.” paglilinaw ni Kris sa isyu. “I refuse to disappoint my mom, so if it is God's plan it will be part of His timing, not mine. Until then let me be the best mom possible to the most lovable sons God could have ever blessed me with," pagtatapos ni Kris.